I learned yesterday with great sadness of the passing of Rev Irvin Clarke of Exuma.The passing of Rev. Clarke effectively severed the last living link in Exuma to the original independence service in July 1973. He preached the Independence service in 1973 and was a fixture every year as a leading pastor and Christian leader in Exuma. I have joined the people of Exuma every year since 1998 to observe the nation's independence and he has always been there. Sadly he was too ill to attend this year but we were able to extend greetings to him by radio and later in the House of Assembly. So another soldier of the Independence movement has gone on to eternity.I called Rev Franklin McKenzie and MP for Exuma Anthony Moss yesterday to extend my condolences on his passing. 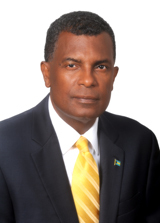 I extend to all his family and friends and to the people of Exuma my condolences. He was a good man and an exemplary leader. A proud Bahamian.